What is a chisel-tip rock hammer? The chisel-tip rock hammer has a hammer head on one end and a slightly curved chisel-shaped blade on the other. It is used mainly by geologists who are working in areas underlain by sedimentary rocks and sediments. Names given to this hammer include: Mason's hammer, bricklayer's hammer, soft-rock hammer and chisel-tip hammer. 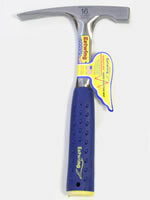 The flat end of this hammer is used for breaking rocks and light chisel work. The chisel end is used for splitting the layers of sedimentary rocks, trimming rocks, and digging in soils and sediments. These hammers are used by geologists, fossil hunters, and a number of professions who break sedimentary rocks or masonry materials. The head and handle are forged from a single piece of steel, and the soft grip is designed to be comfortable in your hand and to reduce the vibrations of impact. Always wear eye protection, long sleeves, long pants and gloves when using these tools. Flying rocks hurt and they often have sharp edges. Be sure that your colleagues are protected or at a distance before you begin work. 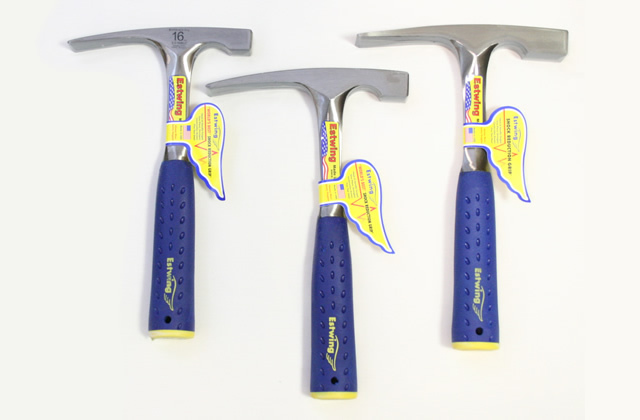 These hammers are sold in 16-ounce, 20-ounce, and 24-ounce sizes. Four ounces makes a lot of difference when you are trying to deliver accurate hits. Buy one that is small enough that you can easily use accurately at the end of a long field day. Most rocks are easier to break with a sharp, accurate hit than with force. 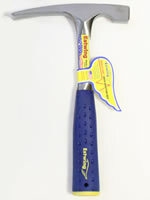 This is a medium-weight chisel-tip rock hammer. 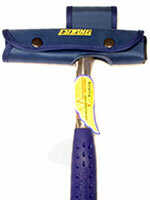 This is a good hammer for an adult who is a light hitter or who does not have lots of experience with a rock hammer. Experienced geologists know that a 16-ounce hammer is easier on your body and easier to control than a heavier tool. This hammer does have the ability to break a tough rock because you can use it to deliver a more accurate hit. Length: 10.5". Get a hammer sheath below to carry this tool on your belt. This is the standard-weight chisel-tip rock hammer. 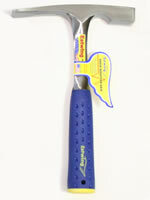 Most of the chisel-tip hammers that we sell are these 20-ouncers. It is heavy enough to break a tough rock. If you are going to be hammering a lot, this one will be less fatiguing than a heavier hammer but more fatiguing than a 16-ounce. Length: 11". Carry it on your belt using the sheath below. This is a heavy-weight chisel-tip rock hammer. It is used by strong, experienced people who are breaking larger or more durable rocks. If you are not strong and experienced at using a rock hammer, this one might be difficult to use accurately - and if you do a lot of hammering, you will feel it in your wrists and forearms the next morning. Length: 11". The sheath below fits this tool. This snap-button nylon sheath fits all of the chisel-tip rock hammers sold above. The hammer end of the sheath is closed. The chisel end of the sheath is open but completely covers the chisel. A large loop allows you to easily and safely carry this hammer on your belt. It is also a good cover if you are carrying your hammer in a bag or backpack. Sheath only - hammer not included.